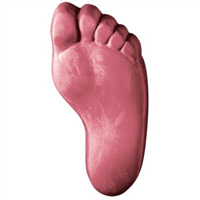 Remind the kids to wash their feet with this clever Foot Soap Mold. Also perfect for baby showers, podiatry students, reflexologists, tap dancers, runners, and the cast of STOMP. 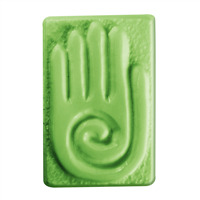 Bar Depth: 1.25" Bar Length: 4.5"
Did you know that the hand is the most frequently symbolized part of the human body? It’s often used to represent generosity, healing, peace, and friendship. 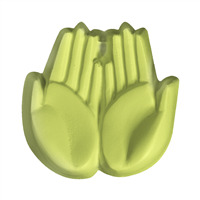 The Loving Hands Soap Mold features five helping hands with heart cutouts in a circular mold, symbolizing family, community, and love. The Healer Hand is a symbol of healing with therapeutic energy, and has been seen in the American Southwest on rock and cave paintings. In modern times, this hand with spiral design has been associated with Reiki, a healing practice where a therapists channels energy. 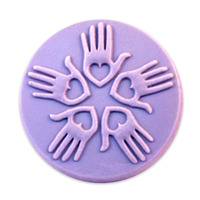 Channel your energy to create beautiful soaps molded with this Spiral Hands Soap Mold.